Waterproof headphones in combination with waterproof case and ordinary mp3 player, can be a good alternative to a dedicated underwater mp3 player. Music fans of all ages have recently welcomed the ability to take their mp3 players to the beach, to the lake, and even underwater. The new generation of waterproof mp3 players has revolutionized water sports. But the new devices are not perfect. While they are rated for more than one hour at a ten foot depth, sound quality and functionality are often not what we’re used to with our digital devices. Features like shuffle are sometimes missing; buttons are small to avoid underwater drag; sound quality is not up to par. Another option is to waterproof the equipment you have. Waterproof cases are available from many manufacturers for all mp3 players and most cell phones, and a set of waterproof headphones will complete the picture. It’s easy to weather proof your mp3 player or phone. Seal it in a Ziploc bag and stuff it in your pocket. But how do you waterproof normal headphones? You can’t. Purpose-built units need to be used. These were first introduced in response to demands from sportsmen who needed them for water sports like boating and fishing. The development of waterproof earbuds and waterproof cases continued cooperatively. 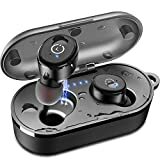 Now waterproof headphones have been optimized so that their use, whether with a totally waterproof mp3 player or used with a normal player in a waterproof case, will greatly improve sound quality and comfort during use. Remember first of all that there’s a difference between “water resistant” and “waterproof”. Don’t buy water resistant headphones if you really need waterproof. If you plan to use these underwater, check the depth to which they are rated. While standard is 1 hour at 10 feet, your activities may require another certification. Sound quality is also quite important. Frequency response measures the reproduction range of the headphones, and you want at least 80 – 5000 Hz reproduction. Wider range means more accurate sound reproduction and higher quality. Most importantly, how do they feel? 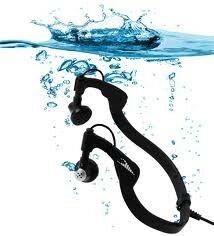 While you’re underwater, the headphones have to fit tightly and securely in order to deliver the audio. If you swim vigorously, the fit has to be even tighter to avoid losing an ear phone in the pool or ocean. Different types of ear phones are available, so check around before making a selection. Consider the amount of time that you’ll be wearing the device and gage your comfort level. Also exercise caution if going to significant depths, as plugged ears could cause a health risk during compression / decompression.